Saint Zita is the patroness of domestic servants. She rests for eternity in the Basilica of San Frediano in Lucca. The church is breathtakingly beautiful, with high arches and frescoes and dark old pews smoothed by centuries of worshipers sliding their length. The story we were told by a local was that little Zita was a household servant at 12 years old, in the palazzo of the Fatinelli family. She was a favorite of the family. Some evenings she left the palazzo with bread she took to feed the poor. The other servants were jealous and told Fatinelli of Zita’s theft. That evening, he approached Zita as she left the palazzo with something under her cloak. He made Zita open her cloak, only to find flowers. Bread turning into flowers was Zita’s miracle. She was allowed to go on her way and kept her post at the palazzo, serving the family until her death at 60, in 1278. The local told us that Zita was the Patron Saint of Flowers. I did some reading and found several versions of this story. Some said her early days with the Fatinellis were terrible. She was beaten and abused but went on with her duties, believing her service was God’s will and that devotion is false if slothful. I read that eventually the family came to respect her and she was made head housekeeper and given much freedom. She is in fact the Patroness of servants, not flowers. People appeal to Saint Zita as they cross bridges and when they lose their keys. I am not Catholic, so know nothing of Saints but found Zita’s story endearing. Saint Zita’s body was exhumed in 1580 and she was placed in a glass case in the Basilica of San Frediano. She lies there today, over 500 years later. Small, mummified and dressed in finery. Her petite brown hands are crossed. I believe Sainthood must be hard on a person, because little Zita looks her age. I found this photograph online and I would give credit to the person who took it if I had a way to find out who the photographer was. 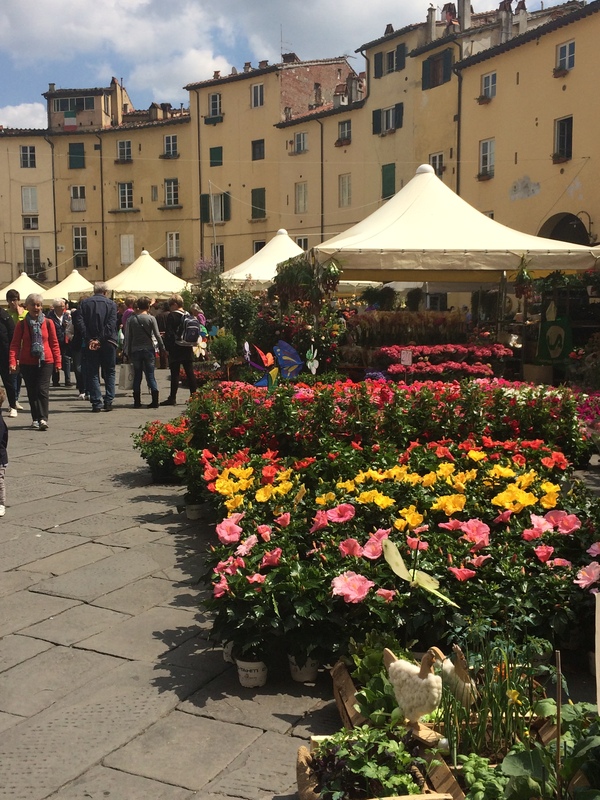 We happened to be in Lucca on April 27th. 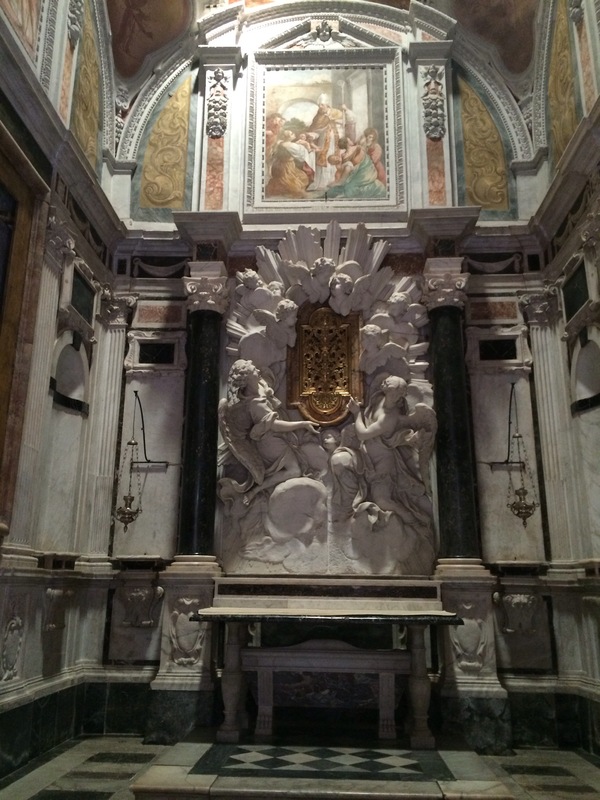 We walked into the Basilica of San Frediano and Zita’s glass case had been moved to the center of the sanctuary. There was a flower vendor selling flowers to worshipers. Zita had a personal guard stationed next to her. The worshipers passed Zita one by one, made the sign of the cross and laid a small bouquet next to her. I stood back and observed for a little while. It felt wrong to take pictures that day, so I did not. It also felt wrong to leave the Basilica without making the sign of the cross for Saint Zita, so I did. Lucca also celebrated Zita with flowers to represent her miracle. 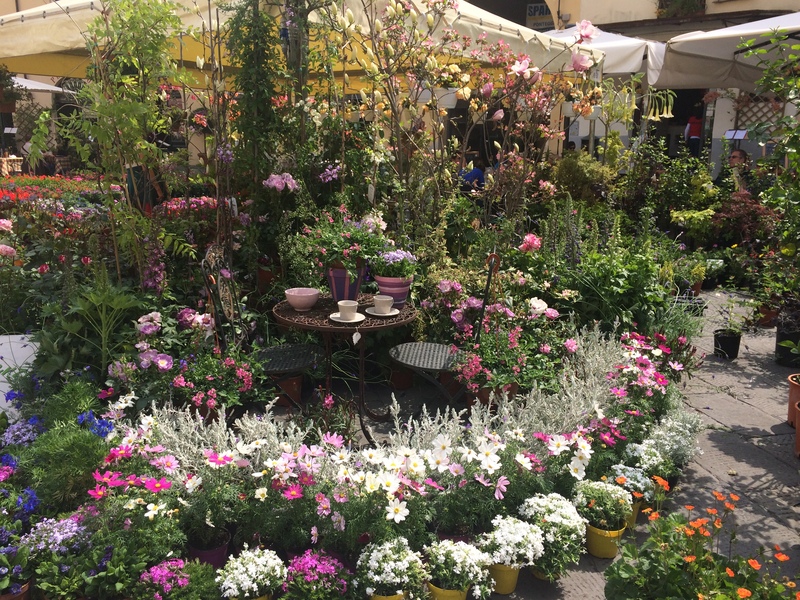 Every piazza was decorated in bright flora, it was lovely. The risk is quite low, but I do not think Sainthood is for me. I can think of few worse places to spend eternity than in a glass box being stared at by thousands of people each year, looking like a dried apple in a dress. Like I said, I am not Catholic and don’t mean to offend anyone who is. The churches of Italy offered me a glimpse into a strange new, very old world. Quite a story. Thank you so much for sharing!